Ziad al-Bandak, the committee head, said it has collected $14 million out of $17 million needed. Roughly half of the funding has come from the Palestinian Authority and local Muslim and Christian businesses, and the rest from foreign donors. One of Christianity’s most sacred shrines, the church was built in the 4th century by Saint Helena over a cave where the Virgin Mary is said to have given birth. What pilgrims mostly see today is the basilica built by Byzantine Emperor Justinian I, who ruled from A.D. 527 to 565. Emad Nassar, a Palestinian engineer overseeing the renovations, said the project started with the ceiling. Roughly 10 percent of the beams were replaced with wood imported from old destroyed churches in Italy, windows were fixed, and outside stones and walls were renovated. 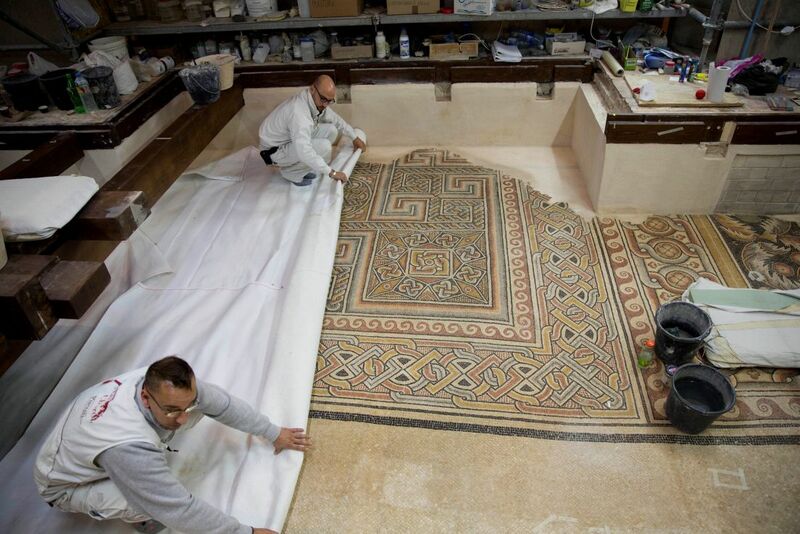 Perhaps the biggest challenge has been repairing the badly damaged 2,000 square meter (21,500 square foot) wall mosaic. 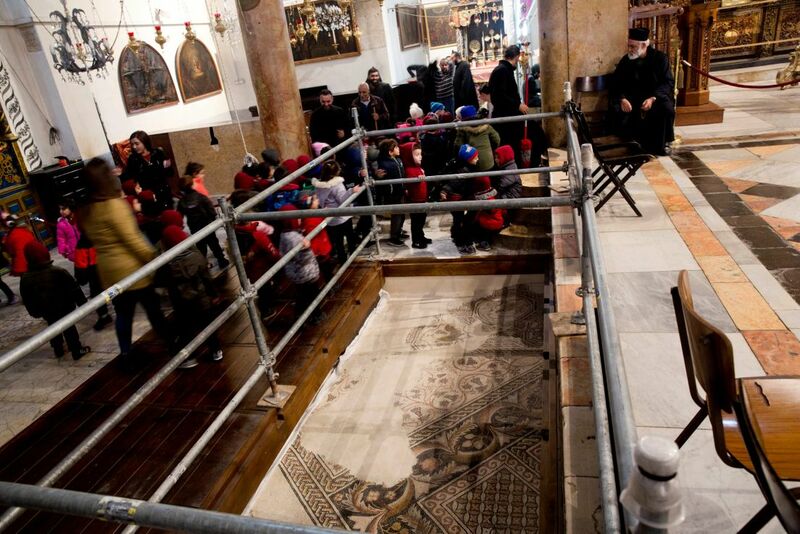 So far, 120 square meters (1,292 square feet) have been restored, depicting images of Christ and Christian saints. 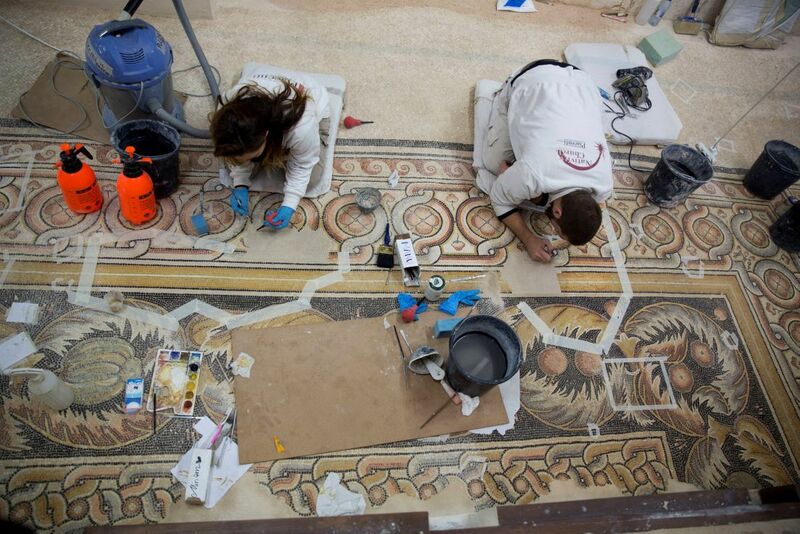 Workers are also restoring a floor mosaic. 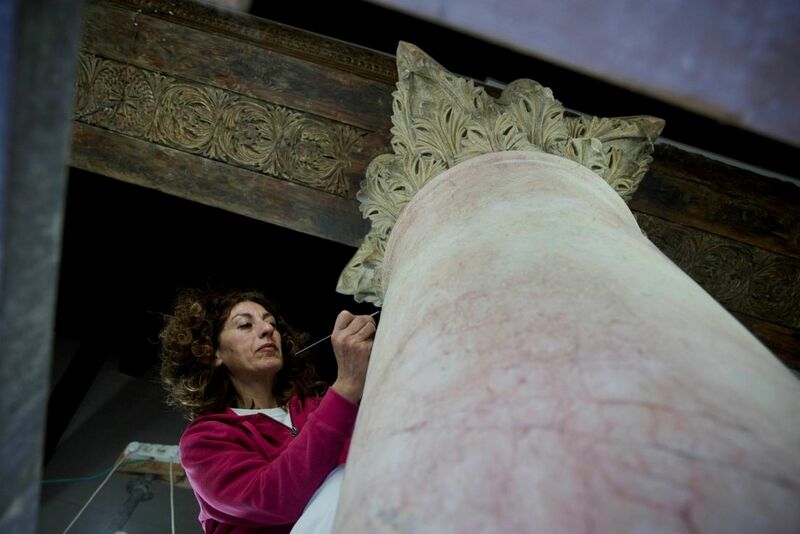 The restoration process is meticulous and painstaking. As Nassar spoke, three Italian workers were cleaning a mosaic with tiny brushes and covering them with protective material. “In the coming year, we are going to continue renovating the columns, the floor mosaic, the tiles and the front yard floor,” Nassar said. The delicate relations between the Holy Land’s major Christian denominations have factored into the poor condition of the church. The Roman Catholic, Greek Orthodox and Armenian churches have traditionally viewed each other with deep suspicion. Father Samour, a 70-year-old Greek Orthodox clergyman who has served at the church for nearly half a century, said the Palestinian Authority managed to get the rival churches on board. “The mosaic on the walls is very beautiful, and the renovation is very impressive,” said Sandris Gradins, a 31-year-old tourist from Latvia. 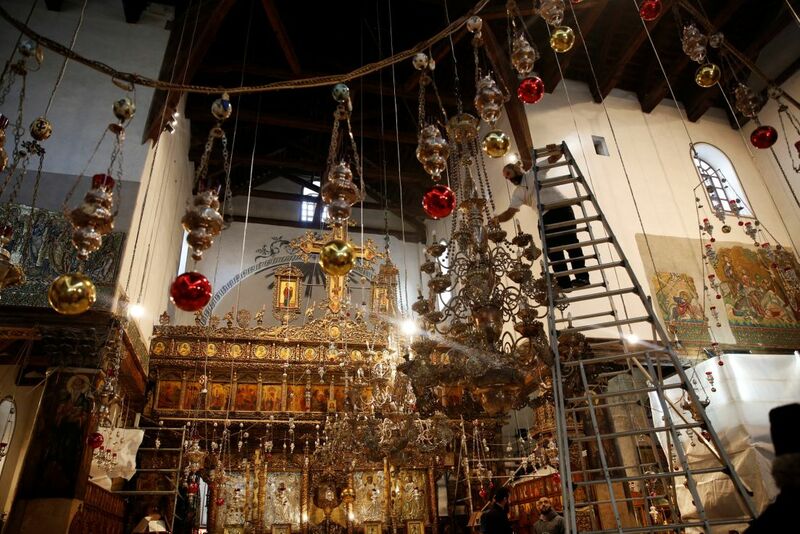 But whether the city’s efforts can stop the long-term outflow of Bethlehem’s Christians remains to be seen. As elsewhere in the Arab world, the local Christian community has struggled for decades, escaping conflict and economic troubles in search of better opportunities abroad. In the Holy Land, Israel’s half-century-old occupation of the West Bank and east Jerusalem, and more than a decade of rule by the Islamic militant group Hamas in Gaza have significantly worsened the situation. A 2017 census in the West Bank, Gaza and east Jerusalem counted just under 47,000 Palestinian Christians, or about 1 percent of a Palestinian population of close to 4.8 million. Twenty years earlier, Christians still made up more than 1.7 percent of the Palestinian population, according to the Palestinian Central Bureau of Statistics. Wadie Abunassar, a senior adviser to church leaders in the Holy Land, said the Palestinian leadership in the West Bank has treated Christians well, but that lack of progress toward a resolution with Israel and Palestinian statehood have driven emigration.